Cytosolic gIVaPLA2 is a critical enzyme in the generation of arachidonate metabolites and in induction of β2-integrin adhesion in granulocytes. We hypothesized that gIVaPLA2 activation also is an essential downstream step for post adhesive migration of PMN in vitro. Migration of PMNs caused by IL-8/CXCL8 was assessed using a transwell migration chamber. PMNs were pretreated with two structurally unrelated inhibitors of gIVaPLA2, arachidonyl trifluoromethylketone (TFMK) or pyrrophenone, prior to IL-8/CXCL8 exposure. The fraction of migrated PMNs present in the lower chamber was measured as total myeloperoxidase content. GIVaPLA2 enzyme activity was analyzed using [14C-PAPC] as specific substrate F-actin polymerization and cell structure were examined after rhodamine-phalloidin staining. IL-8/CXCL8-induced migration of PMNs was elicited in concentration- and time-dependent manner. Time-related phosphorylation and translocation of cytosolic gIVaPLA2 to the nucleus was observed for PMNs stimulated with IL-8/CXCL8 in concentration sufficient to cause upstream phosphorylation of MAPKs (ERK-1/2 and p38) and Akt/PKB. Inhibition of gIVaPLA2 corresponded to the magnitude of blockade of PMN migration. Neither AA nor LTB4 secretion was elicited following IL-8/CXCL8 activation. In unstimulated PMNs, F-actin was located diffusely in the cytosol; however, a clear polarized morphology with F-actin-rich ruffles around the edges of the cell was observed after activation with IL-8/CXCL8. Inhibition of gIVaPLA2 blocked change in cell shape and migration caused by IL-8/CXCL8 but did not cause F-actin polymerization or translocation of cytosolic F-actin to inner leaflet of the PMN membrane. We demonstrate that IL-8/CXCL8 causes a) phosphorylation and translocation of cytosolic gIVaPLA2 to the nucleus, b) change in cell shape, c) polymerization of F-actin, and d) chemoattractant/migration of PMN in vitro. Inhibition of gIVaPLA2 blocks the deformability and subsequent migration of PMNs caused by IL-8/CXCL8. Our data suggest that activation of gIVaPLA2 is an essential step in PMN migration in vitro. 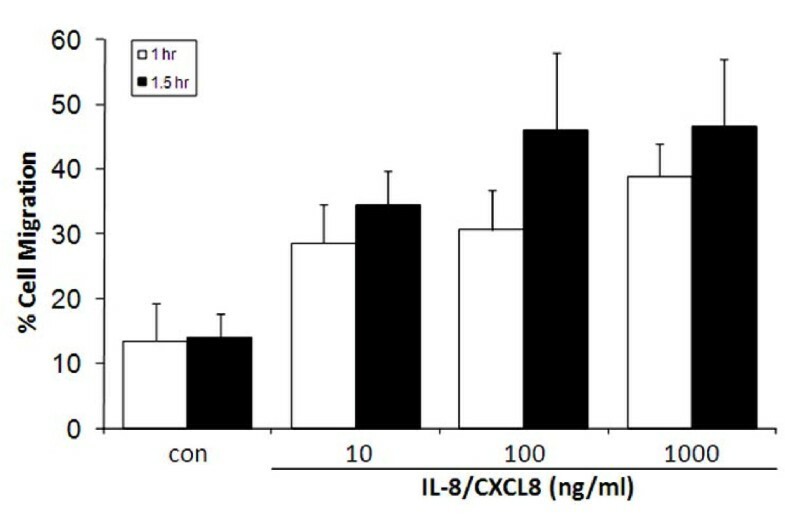 IL-8/CXCL8 is a selective and potent neutrophil chemoattractant. Previous studies have shown that upstream activation of PI3K, ERK-1/2, or p38 MAPK [1–7] pathways caused by IL-8/CXCL8 regulates the induction of transendothelial PMN migration. However, the signaling mechanism downstream of these kinases in causing migration of PMNs has not been established previously and critical intermediate steps regulating neutrophil migration remain unknown. Phospholipase A2s (PLA2) are esterases that cleave glycerophospholipids at the sn-2 ester bond, releasing a fatty acid and a lysophospholipid [8–11]. PLA2s are divided into five different groups; a) secretory PLA2 [12, 13], b) cytosolic gIVPLA2 (gIVPLA2) , c) Ca2+-independent PLA2, [15, 16] d) platelet-activating factor hydrolyses, [17, 18] and e) lysosomal PLA2 . Among these groups, gIVaPLA2 is thought to be not only a rate-limiting enzyme in eicosanoid biosynthesis  but also to be essential in maintenance of β2-integrin adhesion in granulocytes [21, 22]. We have shown previously that ERK-1/2 and Akt/PKB phosphorylation activated gIVaPLA2 to cause β2-integrin adhesion of granulocytes to ICAM-1. We also have shown that phosphorylation to activate gIVaPLA2 results from upstream phosphorylation of these kinase and that maintenance of this phosphorylated state regulates the process of β2-integrin adhesion [24, 25]. Because MAP kinase and PI3K also regulate gIVaPLA2 phosphorylation, we postulated that activation of gIVaPLA2 might regulate neutrophil migration. The objective of this study was to examine specifically the functional role of gIVaPLA2 in PMN migration caused by IL-8/CXCL8. IL-8/CXCL8 was applied in concentration causing upstream phosphorylation of ERK-1/2, p38 MAPK and Akt/PKB. We found that inhibition of gIVaPLA2 activity blocked substantially the transmigration toward IL-8/CXCL8 in a transwell chamber. This study is the first demonstration that activation of gIVaPLA2 is a critical regulatory step subsequent to upstream activation of signaling kinases in eliciting PMN migration. IL-8/CXCL8 was purchased from Peprotech (Rocky Hill, NJ) while bovine serum albumin fraction V and human polymophonuclear leukocytes (PMNs) isolation materials were purchased from Sigma-Aldrich Chemical Co. (St. Louis, MO). Anti-phosphorylated gIVaPLA2 Ab (Ser505) was purchased from Cell Signaling Technology (Beverly, MA). Mouse IgG was purchased from BD Biosciences (Mountain View, CA). Polystyrene 96-well microtiter plates were obtained from Neuro Probe (Gaithersburg, MD). Rhodamine-phalloidin was obtained from Sigma-Aldrich Chemical (St. Louis, MO). Venous blood from normal human subjects (20-45 years old) was collected in heparin-containing tubes, and PMNs were isolated by Ficoll-Paque sedimentation as described previously [26, 27]. Purity of PMN on H and E-stained cytoslides was ~90-95%. Informed written consent was obtained from all volunteers in this study. PMN migration in transwell microplates was assessed using the standard methods as described previously . Preliminary experiments have established that the number of cells (4 × 104 cells) used allow the optimal % cell migration without clogging the pores of transwell filter of the upper chamber. Cells then were preincubated with HBSS, 3 μM - 30 μM arachidonyl trifluoromethylketone [TFMK; inhibitor of gIVaPLA2 , or 10-9 M -10-6 M pyrrophenone [inhibitor of gIVaPLA2  for 30 min at 37°C. Treated cells in 50 μl HBSS were transferred onto 5 μm-pore transwell filters positioned on top of the migration chamber. HBSS or 10 ng/ml to 1000 ng/ml IL-8/CXCL8 was loaded in the bottom chamber (final volume = 310 μl), and the transwell microplates were incubated for 60 min and 90 min at 37°C. The migrated PMNs were treated with 100 μl of HBSS + 10% FBS buffer and 100 μl developing solution [8 ml 100 nM NaH2PO4 (pH = 5.5), 1000 μl 10% hexadecyltrimethylammonium bromide (HTAB), 3 μl 30% hydrogen peroxide, 1000 μl 10% o-dianisidine dihydrochloride]. The reaction was terminated by addition of 50 μl sulfuric acid and myeloperoxidase (MPO) activity was measured at 405 nm in a Thermomax microplate reader (Molecular Devices, Menlo Park, CA). The fraction of migrated PMNs present in the lower chamber was measured as total MPO content. Data were expressed as % cell migration. Maximal, no-toxic inhibitory concentration of TFMK and pyrrophenone were established in initial studies demonstrating blockade of gIVaPLA2 activity [see also Results]. 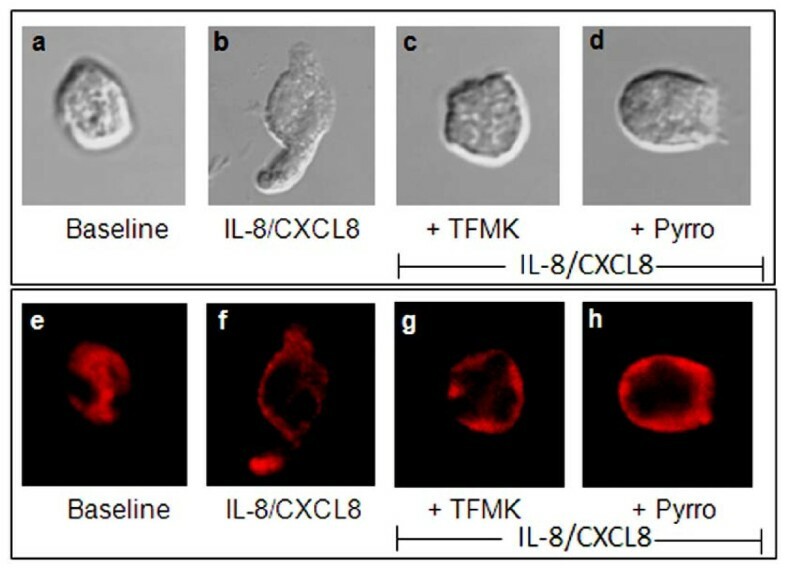 In separate studies, morphological changes of the non-migrated cells (top chamber) and migrated cells (bottom chamber) toward IL-8/CXCL8 were examined. The effect of 30 μM TFMK or 10-6 M pyrrophenone on cell deformability caused by IL-8/CXCL8 also was examined using confocal microscopy. PMNs (106 cells/group) were activated with HBSS and 100 ng/ml IL-8/CXCL8 at different time intervals, and phosphorylation of ERK-1/2, p38 MAPK, and Akt/PKB were analyzed using Western blot. The pellet was lysed in disruption buffer (20 mM Tris-HCl, 30 mM Na4P2O7, 50 mM NaF, 40 mM NaCl, 5 mM EDTA, pH 7.4) containing 1% Nonidet P-40, 10 μg/ml leupeptin, 5 μg/ml aprotinin, 1 mM PMSF, 2 mM Na3VO4, and 0.5% deoxycholic acid. Samples were loaded to SDS-PAGE using 8% (gIVaPLA2) or 10% (ERK-1/2, p38 MAPK, PI3K) acrylamide gels under reducing conditions. The membrane was blocked with 1% BSA in TBS-T buffer and phosphorylated Ab against ERK-1/2 (1:1000; Cell Signaling Technology; Beverly, MA), p38 MAPK and Akt/PKB (1:1000; Cell Signaling Technology; Beverly, MA), or Ser505 gIVaPLA2 (1:1000) was added followed by relevant secondary Ab conjugated with HRP. Protein of interest was analyzed by an enhanced chemiluminescence system (Amersham, Arlington Heights, IL). Isolated PMNs were incubated in RPMI medium containing 5% FBS and 0.5 μCi [3H]AA. Labeled PMNs were incubated for 2 h and unincorporated [3H]AA was washed away by HBSS containing 0.2% BSA. Thereafter, treated PMNs were activated with saline, 100 ng/ml IL-8/CXCL8 or 1 μM FMLP (+ 5 μg/ml cytochalasin B). The reaction was terminated by centrifugation at 12,000 × g for 1 min. Supernatant were collected, and pellets were lysed in 1% Triton X-100. [3H]AA release was measured by scintillation counting and expressed as counts per min (cpm) [21, 24]. Aliquots of 250,000 were activated with saline, 1-1000 ng/ml IL-8/CXCL8, or 1 μM FMLP (+ 5 μg/ml cytochalasin B) for 15 min at 37°C in a final volume of 250 μl HBSS. The reaction was terminated by centrifugation at 12,000 × g for 1 min. Aliquots of supernatants were assayed with a commercial EIA kit as previously described [24, 31]. GIVaPLA2 activity assay was determined in aliquots of 2 × 106 cells incubated for 15 min at 37°C with 3 μM - 30 μM TFMK or 10-10 M - 10-6 M pyrrophenone. Activity was measured at optimal time (30 min) after 100 ng/ml IL-8/CXCL8 [see Results]. This time and concentration were shown in initial studies to cause phosphorylation of gIVaPLA2 in PMNs. The cell pellets were resuspended in disruption buffer (see above) and immediately sonicated followed by addition of specific substrate ([14C]-PAPC) for gIVaPLA2[24, 31]. To measure precisely the total gIVaPLA2 activity, 5 mM dithiotrietol was added to cell lysate to inactivate, if any, the remaining 10-14 kDa secretory PLA2 enzymes that could interfere with the assay. Thirty min later, the reaction was terminated by adding 560 μl of Dole's reagent (heptane:isopropyl alcohol:1 N H2SO4; 400:390:10 by vol), and the radioactivity was measured in a liquid scintillation counter and expressed as picomoles/30 min/106 cells . Freshly isolated PMNs were preincubated with either saline, 100 ng/ml IL-8/CXCL8, or 10-6 M FMLP for 15 min at 37°C. After washing with PBS, treated cells were centrifuged for 1 min at 400 × g. The pellet were lysed in 50 μl disruption buffer (see above) and put on ice for 10 min. The disrupted pellets, which are mainly nuclear component of the cells, were centrifuged at 500 × g for 1 min. A total of 50 μl of boiling buffer was added to the pellets and boiled for 5 min. The supernatants were centrifuged again at 100,000 × g for 1 h. Eight μl of loading buffer was added to the collected supernatant, which is the cytoplasm fraction, and was boiled for 5 min. Samples were loaded onto SDS-PAGE and membrane was probed with pAb against cPLA2. The translocation of cytosolic gIVaPLA2 to the nuclear component of the cells was detected by an enhanced chemiluminescence (Amersham, Arlington Heights, IL). Change in cell shape and F-actin polymerization were examined in migrated cells. HBSS or rhodamine-phalloidin  was added to the paraformadehyde-fixed cytoslides containing samples and changes in cell shape and F-actin polymerization were analyzed by confocal microscopy. Experimental data are expressed as mean ± SEM in each group. Student's t-test was used for comparison between two-paired groups. Where multiple comparisons were made, differences on concentration-response curves for the same agonist or inhibitor were compared after Bonferonni correction. Variation between more than two groups was tested using one-way ANOVA followed by Fisher' least protected difference test. Statistical significance was claimed when P < 0.05. Migration of PMNs toward the IL-8/CXCL8 chamber increased in time- and concentration-dependent manner (Figure 1). Transmigration caused by 100 ng/ml IL-8/CXCL8 was substantially greater after 90 min incubation time compared to 60 min incubation time. PMN migration across the transwell filter in the absence of IL-8/CXCL8 was < 15%. Transmigrated PMNs increased from 14.0 ± 3.7% to 46.0 ± 11.9% after 100 ng/ml IL-8/CXCL8 (P < 0.05); 1000 ng/ml IL-8/CXCL8 had no further effect on migration on PMNs. Accordingly, a 90 min incubation time and a concentration of 100 ng/ml IL-8/CXCL8 were used for all subsequent migration assays. IL-8/CXCL8-induced neutrophil (PMN) migration. The concentration-response curve to IL-8/CXCL8-induced PMN migration was generated at 60 min or 90 min, and migration was assessed by measuring total myeloperoxidase activity in the neutrophil fraction (see Methods section). Data are expressed as % cell migration from N = 5 isolations. We first demonstrated that the 100 ng/ml concentration of IL-8/CXCL8 used in these studies caused phosphorylation of critical upstream kinases, ERK-1/2, p38 MAPK and Akt/PKB (a target protein for PI3K), in the same PMN isolates (Figure 2). Phosphorylated ERK-1/2 was greatest at 0.5-1 min and gradually decreased thereafter. The p38 MAPK and Akt/PKB were constitutively expressed in unstimulated PMNs. Treatment with IL-8/CXCL8 upregulated the phosphorylation of p38 MAPK and Akt/PKB, which unlike ERK-1/2, was sustained for ≥ 15 min. Total protein for ERK-1/2, p38 MAPK, and Akt/PKB was stained with respective Ab to demonstrate equal loading of samples. 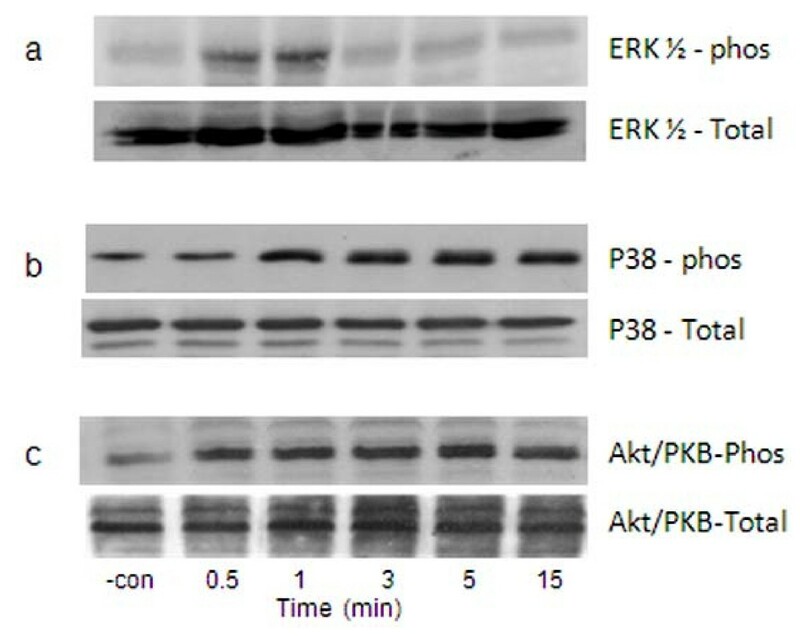 Phosphorylation (phos) of ERK-1/2, p38 MAPK, and Akt/PKB caused by IL-8/CXCL8. Whole cells extracts were prepared from isolated PMN treated with 100 ng/ml IL-8/CXCL8 at different times. Lysed PMNs were then stained with specific pAb directed against phosphorylated a) ERK-1/2, b) p38 MAPK or c) Akt/PKB. Equal loading of sample is demonstrated by staining of total protein for each kinase. Results shown are representative immunoblots obtained from 4 healthy donors. Negative control (-con) is buffer-activated cells. Non-stimulated PMNs released minimal amounts of AA and undetectable amounts of LTB4. Activation with IL-8/CXCL8 did not elicit secretion of either AA or LTB4 in PMNs. All treated PMNs remained viable as assessed by trypan blue exclusion dye analysis. Measurements were performed as described in Methods section. Cytosolic gIVaPLA2 is a downstream target of ERK-1/2, p38 MAPK and PI3K during cell adhesion [21, 23, 25]. We next determined whether gIVaPLA2 was a downstream regulator of PMNs in vitro. Activation of PMNs with IL-8/CXCL8 caused rapid phosphorylation of gIVaPLA2 (Figure 3a). The phosphorylated Ser505 110-kDa-gIVaPLA2 protein was greatest at 3 min and was sustained ≥ 30 min; thereafter, the gIVaPLA2 phosphorylation decreased to baseline level. Total gIVaPLA2 proteins stained with Ab against this protein demonstrated equal loading of samples onto SDS-PAGE. Phosphorylation (phos) of group IVa phospholipase A 2 (gIVaPLA 2 ) caused by IL-8/CXCL8 activation. a) Treated PMNs were activated with 100 ng/ml IL-8/CXCL8 at different time intervals, in minutes (min) and were lysed immediately. 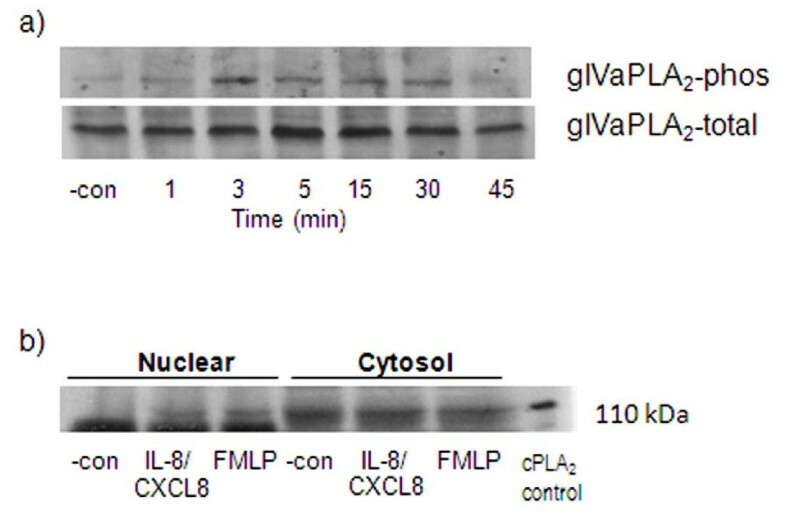 Treated samples were subjected to Western blot analysis and probed with pAb directed against Ser505 gIVaPLA2 (top) or pAb against total gIVaPLA2 (bottom). Total gIVaPLA2 protein was stained with pAb directed against total gIVaPLA2 to indicate equal loading of samples. Representative immunoblot from 3 independent experiments. b) Translocation of cytosolic gIVaPLA2 to the nuclear component of PMNs was examined by subfractionation. Representative blot from 3 different donors was shown after staining with mAb against gIVaPLA2. Immunoblotting analysis of cell-fractional components demonstrated that gIVaPLA2 is located mainly in cytoplasm of unstimulated PMNs. Application of IL-8/CXCL8 translocated the cytosolic gIVaPLA2 to some extent, to the nuclear component of PMNs (Figure 3b). We used FMLP as a positive control since we previously have shown that FMLP causes the translocation of cytosolic gIVaPLA2 to nuclear membrane in eosinophils . In separate studies, the inhibitory effect of TFMK and pyrrophenone on stimulated gIVaPLA2 activity in PMNs was determined. Baseline gIVaPLA2 activity was 41.0 ± 7.57 pmol/30 min/106 cells. Activation of PMNs with 100 ng/ml IL-8/CXCL8 increased the gIVaPLA2 activity to 288.3 ± 83.6 pmol/30 min/106 cells (P < 0.001 vs baseline). TFMK (30 μM) caused inhibition to baseline level of gIVaPLA2 activity caused by IL-8/CXCL8 (Figure 4; P < 0.01 vs IL-8/CXCL8-activated PMNs; P = NS vs baseline). Pyrrophenone, a potent gIVaPLA2 inhibitor, attenuated gIVaPLA2 activity in concentration-dependent manner. Pretreatment with 10-10 M pyrrophenone inhibited stimulated gIVaPLA2 activity to 160.0 ± 20.1 pmol/30 min/106 cells (P < 0.05 vs IL-8/CXCL8 alone) and further to 67.5 ± 16.6 pmol/30 min/106 cells with 10-6 M pyrrophenone (P < 0.01 vs IL-8/CXCL8 alone). All treated PMNs remained viable as assessed by trypan blue exclusion dye analysis. IL-8/CXCL8-elicited gIVaPLA 2 enzyme activity. PMNs were pretreated with either 3 μM - 30 μm arachidonyl trifluoromethylketone (TFMK) or pyrrophenone for 30 min prior to IL-8/CXCL8 activation. Cytosolic gIVaPLA2 activity was expressed as picomole (pmol) arachidonic acid (AA)/30 min/106 cells . Results are the mean ± SEM from N = 5 donor isolations. *P < 0.05 vs IL-8/CXCL8-activated PMNs; **P < 0.01 vs IL-8/CXCL8 -activated PMNs. We next determined whether activation of gIVaPLA2 is required for in vitro migration of PMNs. PMNs first were co-incubated with TFMK or pyrrophenone, and migration to 100 ng/ml IL-8/CXCL8 was analyzed as % of total PMNs in the upper chamber prior to treatment (Figure 5). 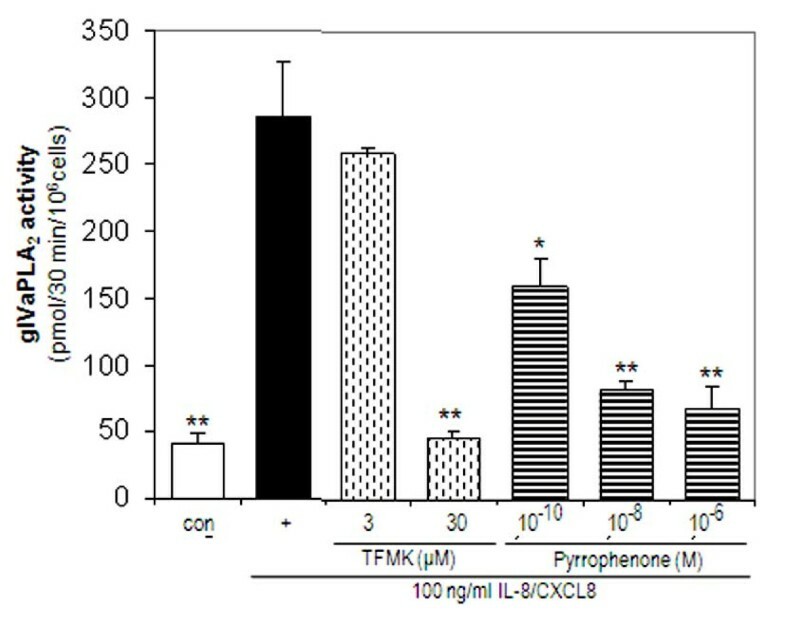 TFMK (Figure 5a) or pyrrophenone (Figure 5b) attenuated the cell migration toward the IL-8/CXCL8 chamber in concentration-dependent manner. PMN migration caused by IL-8/CXCL8 was 53.6 ± 3.5% compared to 10.3 ± 0.4% for PMNs in a buffer control chamber (P < 0.01). Migration was attenuated to 35.7 ± 7.3% after 3 μM TFMK (P < 0.05 vs IL-8/CXCL8 alone) and further blocked to 29.13 ± 4.15% for cells pretreated with 30 μM TFMK prior to IL-8/CXCL8 exposure (P < 0.01 vs IL-8/CXCL8 alone). Treatment with 10-8 M pyrrophenone blocked the migration to 34.1 ± 3.4% (P < 0.05 vs IL-8/CXCL8 alone) and further to 24.9 ± 8.4% with 10-6 M pyrrophenone (P < 0.01 vs IL-8/CXCL8 alone). These data demonstrate that gIVaPLA2 activation is a significant step in neutrophil migration elicited by IL-8/CXCL8 in vitro. Blockade of IL-8/CXCL8-induced cell migration by arachidonyl trifluoromethylketone (TFMK) or pyrrophenone. PMNs were pretreated with 1 μM - 30 μM TFMK or 10-9 M - 10-6 M pyrrophenone for 30 min prior to IL-8/CXCL8 exposure. PMN migration was assessed by measuring the total myeloperoxidase activity in the neutrophil fraction (see Methods section). Data are expressed as % cell migration from N = 6 isolations. *P < 0.05; **P < 0.01 as indicated. We next examined the change in cell shape of migrated PMNs co-incubated with HBSS, TFMK, or pyrrophenone prior to buffer control or IL-8/CXCL8 exposure at 90 min. Representative photomicrographs of cell morphology are shown in Figure 6. PMNs in the buffer control chamber retained their globular appearance after 90 min (Figure. 6a). By contrast, PMNs activated with IL-8/CXCL8 developed an elongated cell shape with a contracted tail (Figure 6b). Blockade of PMNs with TFMK (Figure 6c) or pyrrophenone (Figure 6d) prevented the deformability of cell shape caused by IL-8/CXCL8. Change in cell shape and F-actin polymerization of treated PMNs. (a-d) At 90 min incubation time, migrated PMNs (N = 4 donors) were harvested from the IL-8/CXCL8 chamber of the transwell migration apparatus. Change in cell shape was examined by confocal microscopy. Resting PMNs treated with either buffer (a; baseline), 30 μM TFMK (c) or (d) 10-6 M pyrrophenone (pyrro) for 30 min prior to migration toward IL-8/CXCL8. Treated PMNs were then fixed with 10% paraformaldehyde solution and cytoslides were prepared to examine the change in cell shape. For all groups, baseline is buffer-treated cells. Photomicrographs depict high power (630× magnification). (e-h) Representative confocal photomicrographs of F-actin polymerization caused by buffer (e) or IL-8/CXCL8 (f) in the presence or absence of arachidonyl trifluoromethylketone (TFMK; g) or pyrrophenone (pyrro; h). For all groups, baseline is buffer-treated cells (e). Photomicrographs depict high power (630× magnification). IL-8/CXCL8 caused F-actin polymerization and translocation of cytosolic F-actin to the inner leaflet of PMN membrane (Figure 6). However, inhibition of gIVaPLA2, which prevented the elongation of PMN (see Figure 6c-d), did not block IL-8/CXCL8 -induced F-actin polymerization (Figure 6g-6h). Thus, while activation of gIVaPLA2 is essential for the change in shape of PMNs, F-actin polymerization, another essential step for cell migration, is not regulated by gIVaPLA2. The objective of this study was to examine the functional role of gIVaPLA2 in the regulation of PMNs migration caused by IL-8/CXCL8. Prior studies have reported the signaling role of upstream kinases, ERK-1/2, p38 MAPK, and PI3K [1, 5, 6], in the initiation of cell migration; however, the downstream regulation of PMN migration elicited by IL-8/CXCL8 has not been elucidated previously. We used a transwell-migration chamber  and determined whether inhibition of activated gIVaPLA2 by TFMK or pyrrophenone blocked PMN migration caused by IL-8/CXCL8. We also examined the functional role of gIVaPLA2 in causing in PMN elongation and F-actin polymerization, which both are necessary for PMN migration [34, 35]. While the specific mechanism causing the PMN change in cell shape was not elucidated fully in these studies, we found that inhibition of gIVaPLA2 is sufficient to block change in cell shape caused by IL-8/CXCL8 even in the presence of F-actin polymerization (Figure 6). Studies were designed using IL-8/CXCL8, a potent chemoattractant of PMNs. Prior studies have suggested that IL-8/CXCL8 is rather weak stimulator of human PMNs in comparison to rodent models . Activation of PMNs with IL-8/CXCL8 did not elicit arachidonic acid or LTB4 secretion in human PMNs. Thus, our findings suggest that IL-8/CXCL8 caused transmigration of PMNs by a process that does not involve activation of arachidonate synthesis. Cytosolic gIVaPLA2 is a critical messenger protein for cellular adhesion [21, 22, 27]. We have shown recently that neutrophil or eosinophil binding to ICAM-1 is mediated through activation of ERK-1/2 and subsequent phosphorylation of gIVaPLA2 [22–24, 27]. In all prior cases, we have found that stimuli that upregulate cell adhesion CD11b expression also induce the activation of gIVaPLA2 [22, 24, 25, 27]. However, the role of gIVaPLA2 to mediate PMN migration has not been previously reported. Initial experiments were performed to confirm that upstream kinases, ERK-1/2, p38 MAPK, and PI3K, were activated by the concentration of IL-8/CXCL8 used in these studies (Figure 2). Immunoblotting analysis demonstrates that IL-8/CXCL8 elicited rapid phosphorylation of ERK-1/2, p38 MAPK, and Akt/PKB (Figure 2), confirming that these kinases were activated in these experiments; however, the downstream signaling pathway for cell migration has not been characterized. In this study, we used two-unrelated pharmacological inhibitors of gIVaPLA2, TFMK and pyrrophenone, to elucidate the role of gIVaPLA2 in cell migration. Transmigration of PMNs was blocked substantially in the presence of upstream phosphorylation of ERK-1/2, p38 MAPK and Akt/PKB (a target protein of PI3K) using inhibitors of activated gIVaPLA2. Accordingly, these data indicate a downstream regulatory role for gIVaPLA2 in in vitro PMN migration subsequent to activation of upstream kinases by IL-8/CXCL8. Immunoblotting analysis demonstrated that IL-8/CXCL8 caused phosphorylation and translocation of cytosolic gIVaPLA2 to the nuclear component of PMNs . It has been shown that gIVaPLA2 inhibition effectively blocked cell adhesion and secreted mediators after cell activation [21, 24, 31]. 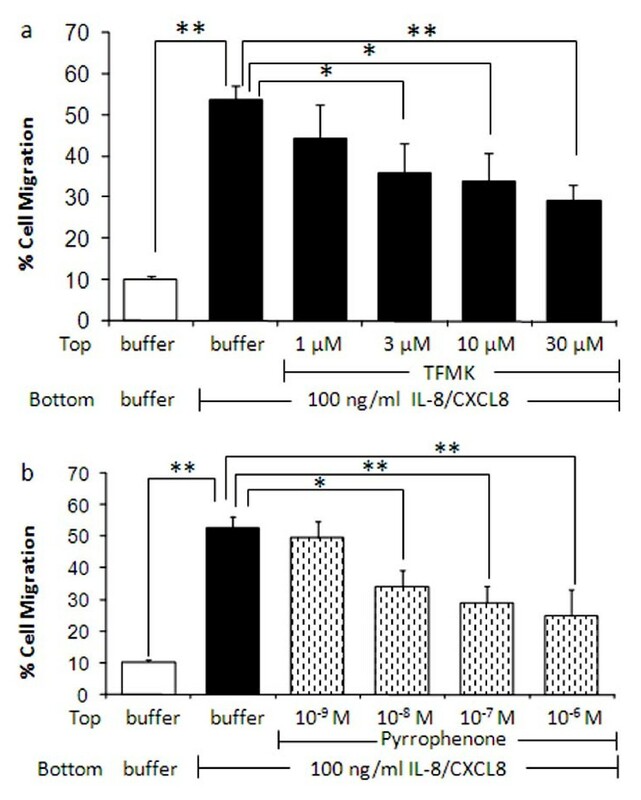 We have demonstrated that inhibition of gIVaPLA2 blocked both gIVaPLA2 enzymatic activity (Figure 4) and cell migration (Figure 5) elicited by IL-8/CXCL8 in concentration dependent manner. These data thus imply that activated gIVaPLA2 is an essential intermediate step in PMN migration in vitro. Prior studies have demonstrated that interference with F-actin rearrangement could contribute to decrease cell migration . We observed that inhibition of gIVaPLA2 with TFMK or pyrrophenone did not prevent the rearrangement of F-actin assembly elicited by IL-8/CXCL8. F-actin polymerization still was evident around the edges of inner cell membrane (Figure 6g-h). These findings suggest that while IL-8/CXCL8 caused change in cell shape, gIVaPLA2 does not directly regulate the rearrangement of the actin cytoskeleton in PMNs. It is important to note some limitations to our in vitro models of PMN migration. We used transwell chamber in vitro to study transmigration of human PMNs. Migration in vitro occurred in the absence of β2-integrin ligation, which is the first step (adhesion) in cell migration in vivo . In vivo conditions are a more complex environment, and it is not possible to extrapolate these data directly to the human situation. Studies in vivo, however, do not allow for stimulus isolation to specify mechanisms and sequence of cell migration. In these studies, maximal migration of PMNs from the upper chamber to the lower chamber containing IL-8/CXCL8 was ~50%. This is comparable to other chemoattractants, i.e., FMLP, C5a and LTB4 . The initial number of cells (5 × 104 cells) was constant in all studies, and was sufficient to cover the area of a chamber (96-well chamber) for optimal PMN migration. Our data demonstrate that gIVaPLA2 activation caused by IL-8/CXCL8 (subsequent to activation of upstream kinases) may be an essential step in human PMN migration. Change in PMN cell shape and migration correspond to increased activity of cytosolic gIVaPLA2 and translocation of gIVaPLA2 to the nuclear membrane. This work was supported by UK GlaxoSmithKline Center of Excellence in Asthma (to A.R.L.) and HL-85779 (to A.R.L.). We would like to express our gratitude to Ron Rosenberg for his technical assistance. NMM and ARL equally contributed to the concept and design of the study, and to the manuscript writing. NMM and AYM performed the data analysis. AYM and LNM performed the assays for gIVaPLA2 enzyme activity, PMN migration, F-actin polymerization, and change in cell shape. CO and DB performed the isolation of PMNs and western blot analysis. XZ and SD participated in the migration assay. All authors read and approved the final manuscript.